Islamabad September 6, 2018: Pakistan Scientific and Technological Information Centre (PASTIC) a subsidiary of Pakistan Science Foundation under the umbrella of Ministry of Science & Technology celebrates Defense Day to pay tribute to Martyrs and Joined Prime Minister Imran Khan’s Billion Tree Campaign. 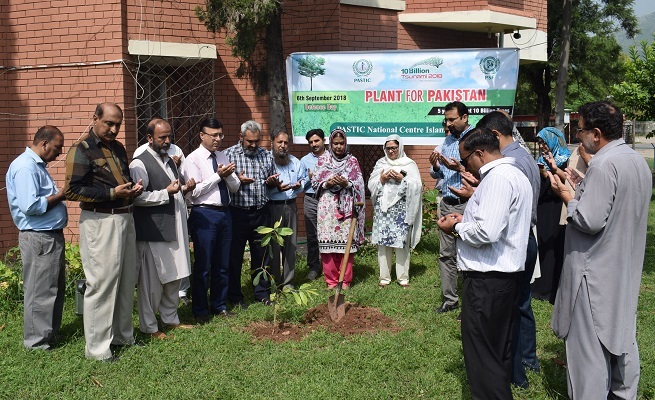 Prof Dr. Muhammad Akram Shaikh, Director General PASTIC inaugurated the campaign while planting an indigenous fruit tree at the lawn of PASTIC Building and pay tribute to martyrs on the special occasion of Defense Day. On the event, Senior officers including Director PASTIC Ms Nageen Ainuddin also participated in tree plantation. All officers & staff of PASTIC was present at the occasion The campaign will be followed by planting of trees by all the PASTIC officers/officials at PASTIC National Centre as well as at all the six sub-centres across Pakistan (Karachi, Quetta, Lahore, Faisalabad, Peshawar and Muzaffarabad).